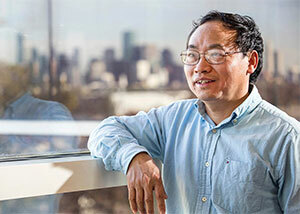 Researchers from the University of Houston have devised a new formula for calculating the maximum efficiency of thermoelectric materials, the first new formula in more than a half-century, designed to speed up the development of new materials suitable for practical use. Zhifeng RenBy using the new formula for calculation, which relies upon newly developed measurements for the figure of merit and power factor of a material – called the engineering figure of merit, or (ZT)eng, and engineering power factor, or (PF)eng – scientists will be able to determine whether devices based on a material would generate energy efficiently enough to be worth pursuing, said Zhifeng Ren, principal investigator at the Texas Center for Superconductivity at UH (TcSUH). The new formula for calculation is explained in a paper published in the Proceedings of the National Academy of Sciences. Ren was lead author, working with Gang Chen, an engineer at the Massachusetts Institute of Technology; Paul Ching-Wu Chu, T.L.L. Temple Chair of Science and founding director of TcSUH; and Hee Seok Kim and Weishu Liu, both physicists and researchers at TcSUH. Thermoelectric materials produce electricity by exploiting the flow of heat current from a warmer area to a cooler area, and the formula still widely used in the field dates to the 1950s, created by Russian physicist Abram F. Ioffe. In thermoelectric materials, efficiency is calculated as the measure of how well it converts heat – often waste heat generated by power plants or other industrial processes – into power. For example, a material that takes in 100 watts of heat and produces 10 watts of electricity has an efficiency rate of 10 percent. Top efficiency for current thermoelectric materials is about 12 percent, Ren said. Ioffe’s formula assumes the thermoelectric properties remain constant despite the variation in temperature along the length of the material, Ren said. That isn’t the case for many materials, and the Ioffe formula is accurate only for thermoelectric materials that operate within a small range of temperatures or those in which the relationship between the dimensionless figure of merit ZT and temperature progresses in a linear fashion. But that relationship often isn’t linear, making the efficiency value produced by the Ioffe formula inaccurate, Ren said. That means new materials with high peak ZT, determined to be highly efficient according to the Ioffe formula, may not work as well in practice if the (ZT)eng is not also high, he said. The researchers actually report two new formulas, one of which also takes into account the Thomson effect, the heat produced by Seebeck when it is temperature dependent along its length. That formula can be used to determine maximum efficiency for any thermoelectric material, Ren said; the other formula developed by the researchers can be used when Thomson heat is ignored. To verify the new formulas, the researchers built and tested devices made with several previously created materials, including a magnesium-silver-antimony (MgAgSb) compound, bismuth tellurides, half-Heuslers and skutterudites. The tested values matched those determined by computational analysis using the new formulas, Ren said. He predicted the new formulas will be welcomed in the engineering world as a way to determine if a new material is worth pursuing, regardless of how high peak ZT is.